After the recent discovery and studies of a system of planets orbiting the ultracool dwarf star Trappist-1, a team of international astronomers, including the University of California San Diego’s Adam Burgasser, announced new information about the composition of the seven Earth-sized planets. According to the new findings to be published in the journal Astronomy and Astrophysics, Trappist-1’s planetary system, dated to be 7.6 billion years old—older than our sun, is made mostly of rock. The planets’ densities, however, now known more precisely than before with data from NASA‘s Spitzer and Kepler space telescopes, suggest that some planets could hold up to five percent of their mass in water—equating to about 250 times more than the Earth’s oceans. 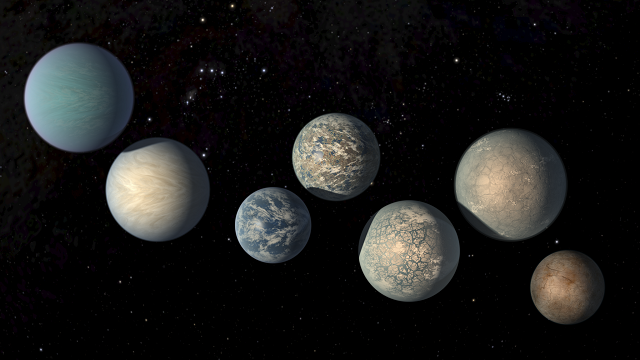 According to the research, the form of water on TRAPPIST-1 planets would depend on the amount of heat each planet receives from their star. For example, planets closest to the star are more likely to host water in the form of atmospheric vapor, while those farther away from the star may have ice on their surfaces. The rockiest planet, known as TRAPPIST-1e, is believed to have the potential to host some liquid water. According to the researchers, despite their new findings, it remains impossible to know exactly how each planet looks because of their distant location in the cosmos. In our own solar system, for example, the moon and the planet Mars share nearly the same density, but their surfaces appear entirely different. “Densities, while important clues to the planets’ compositions, do not say anything about habitability. However, our study is an important step forward as we continue to explore whether these planets could support life,” said Brice-Olivier Demory, co-author at the University of Bern in Switzerland. Scientists are able to calculate the densities of the Trappist-1 planets because they line up in such a way as to pass in front of their star. This enables our Earth- and space-based telescopes to detect a dimming of its light—called transit. The amount by which the starlight dims is related to the radius of the planet. To determine density, scientists use “transit timing variations” collected from the Spitzer observations. If there were no other gravitational forces on a transiting planet, it would always cross in front of its host star in the same amount of time. For example, Earth orbits the sun every 365 days, which defines one calendar year. But because the TRAPPIST-1 planets are packed so closely together, they change the timing of each other’s “years.” These variations in orbital timing are used to estimate the planets’ masses. Then, mass and radius are used to calculate density. In the new study, scientists led by Simon Grimm at the University of Bern created computer models to better simulate the planets based on all available information. For each planet, researchers had to come up with a model based on the newly measured masses, the orbital periods and a variety of other factors—making it an extremely difficult, “35-dimensional problem,” Grimm said. It took most of 2017 to invent new techniques and to run simulations characterizing the planets’ compositions. 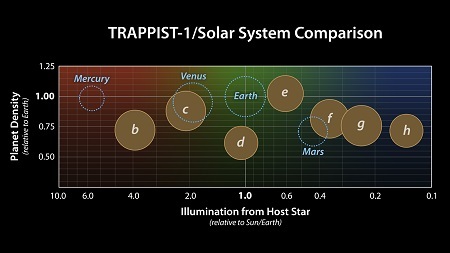 While scientists can make guesses about how the Trappist-1 planets look based on current information, illustrations of these worlds will change as ongoing scientific investigations reveal more about the planets’ properties. Research for this study was funded by the Swiss National Science Foundation, the European Research Council, the U.S. National Science Foundation and NASA.